Got Messes? We’ve got what you need to clean it up! Whether it’s a spill, pet accident or dirty carpet that needs refreshing we’ve got great products to help you get it done and get it clean! Wet Cleaners - referred to as either Steam Cleaners, Carpet Cleaners or Extractors are good for general carpet cleaning as well as picking up spills, pet urine and more. Plus, the machines we carry also include a hose for spot, stair and upholstery cleaning. Some machines also clean floors too! 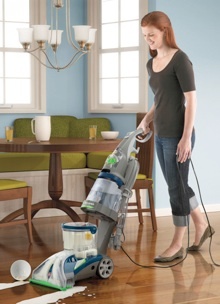 We carry Royal and select Hoover models. Dry Cleaners - Such as the RICCAR brand are an excellent alternative to Wet Cleaners as they use no water and therefore require minimal drying time. And they are effective at general carpet cleaning, spot cleaning, cleaning traffic areas and are ideal for pet stains too. Carpet Cleaners, Carpet Shampooers, Carpet Extractors, Rug Cleaners, Rug Shampooers, Rug Extractors Thanks for visiting Capital Vacuum Raleigh and Cary. 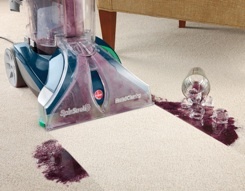 Carpet Cleaner Sales, Service, Repair & Supplies.